AAM designs, engineers, tests and validates components to the vehicle manufacturer's exact specifications. AAM's manufacturing operations - from heat treating and sealing to gear cutting - use proprietary processes and methods. On-going research in noise, vibration and harshness (NVH), thermal management, system and modules, vehicle- system efficiency, vehicle handling and dynamics and other disciplines, help assure you the benefits of today's latest technology. The result: better manufactured components from day one. Insist on AAM Parts. Transtar is now stocking Yokes and U-Joints from AAM for popular transfer case applications. American Axle's helical gear designed limited slip differential provides many traction–enhancing capabilities under most driving conditions, especially for vehicles equipped with traction and stability control systems. Does Transtar carry a full-line of American Axle products? 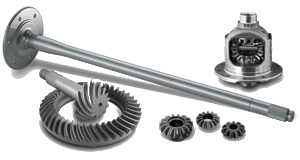 Transtar is proud to carry a full line of AAM Axle Components; Driveshaft Components; and Installation Parts & Kits. Ask your Transtar Sales Rep about all of the American Axle products we carry! In the unlocked mode the locking differential acts as a normal differential. However, in locked mode the left and right axle shafts are coupled together, providing maximum traction with the ground. In this mode, 100% of input torque can be applied to both wheels.